This hilarious picture book is an updated version of the classic nursery rhyme, There Was An Old Lady Who Swallowed A Fly. Here we have a very hungry dragon who is not going to stop until he’s gulped down almost the entire kingdom, knight’s armour and all. The refrain ‘It’s not polite’ is destined to be repeated whenever your little ones do something rude. He ate so much he had to belch… oh my what will come out of that enormous gut? Ben Mantle‘s vivid illustrations with gorgeous expressions bring the tale to life. A gift of a book for 2-6 year olds. Categories: 0-3, 4-6, and Picture Book. 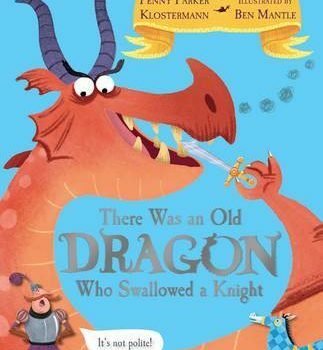 Tags: Ben Mantle, nursery rhyme, Penny Parker Klostermann, and There Was an Old Dragon Who Swallowed a Knight.